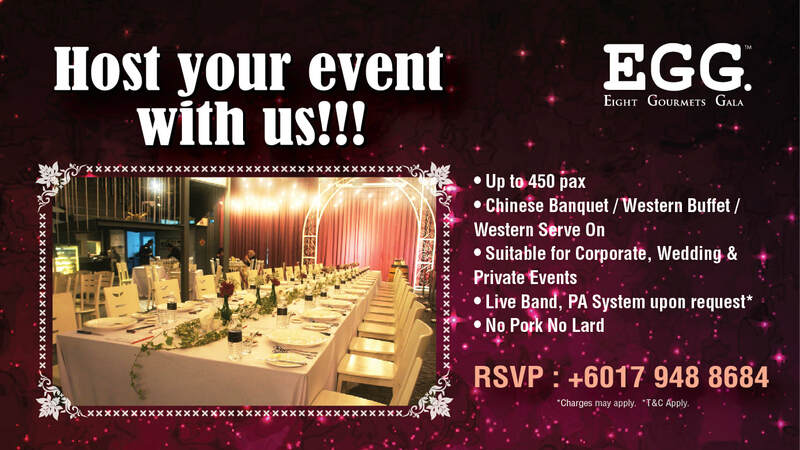 Host your event with us! Strategic location in the heart of Sunway City, wide space and great ambience, one of the top pick event venue in Sunway PJ area. EGG - 8 Gourmets Gala is your everyday gastronomic indulgence. A concept derived from a group of friends who share a fierce passion for food and belief in bringing family and friends closer together through good meals enjoyed together. An egg has many characteristics and is also the key ingredients in many cuisines. Caffeinees (renowned homegrown cafe), Hook & Cook (marketplace - inspired western seafood restaurant), Malt Berry Apes (wine cellar and whisky bar), Queen & Sons (a speakeasy and hidden bar), Hakka Crab (Chinese cuisine kitchen), Confessions of Lady Laura (dessert haven) and other restaurants with special dining. Each restaurant's concept has its own unique character to tantalize taste buds, satiate, palates and ignite the senses.